This journal endeavours to publish research of broad interests in pure and applied mathematics. Each year one volume is published, consisting of four issues (February, May, August, November). The journal has a preference for papers of interest to a broad audience within and outside the mathematical community. Authors should strive for expository clarity and good literary style. Articles published in this journal are indexed or abstracted in Mathematical Reviews and Korea Science Citation Index. 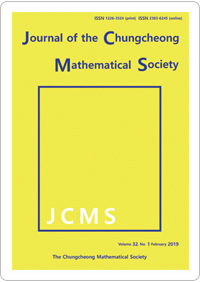 Beginning 1 September 2015, The journal of the Chungcheong Mathematical Society (JCMS) receives papers only through the Electronic Editorial System via http://acoms.jams.or.kr/journal.do? method=journalintro&journalSeq=J000013&menuId=0101∫roMenuId=0101, except for very special circumstances that the JCMS recognizes. This website explains the standard submission process in steps. The system will ask the author(s) to upload the PDF file of the paper. The LaTeX source-file(s) will be needed after the submitted paper has been accepted for publication in the JCMS. (5) a list of key words and/or phrases. Affiliation, mailing address, and/or email address of each author should be included at the end of the manuscript. The items in the reference section should be ordered according to the alphabetical order of the family names of the authors and numbered numerically as , ,…. Figures and graphics, if included, should be prepared suitable for photographic reproduction. The JCMS prefers graphics produced electronically and compiled in the EPS format. The JCMS advises the author(s) to retain the LaTeX source-file and any other related files, until the publication process is completed. The JCMS may require the source-file(s) as soon as the submitted paper(s) are accepted for publication in the JCMS. The journal of the Chungcheong Mathematical Society (JCMS) require to list authors' surnames in alphabetical order. The use of alphabetical authorship is most common in mathematics. By the unique nature of mathematics, the Society does not consider the concept of the first author in mathematical papers, and the Society does not infer about the relative contribution made by the different authors of a publication. For domestic authors, publication fee for the JCMS will be 30,000 Won for each published page if under research grant; otherwise, 20,000 Won for each published page. The signing of a Copyright Transfer Agreement will be required before final publication of a paper in the JCMS. The submission of a manuscript is understood as assurance by the author(s) that it has not been copyrighted, submitted or published anywhere else.